So there I was, working away at the office today when I heard a loud noise from outside the window. On the 26th floor it is not so often that a loud noise is heard so this tends to attract your attention. Upon looking out the window, this was the sight I was greeted with. 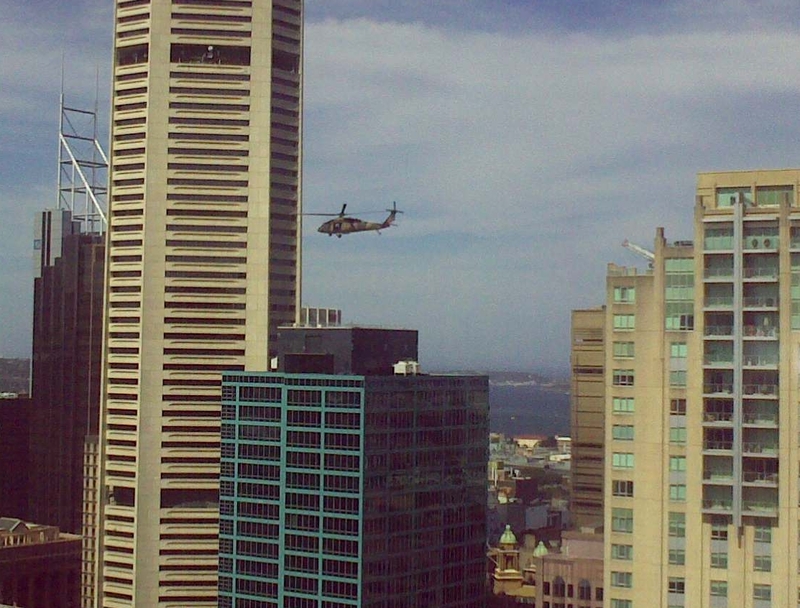 This was one of four helicopters practising repeared passes over (or more like through) the Sydney skyline. As this was the only action happening I can only assume that it was part of the Christmas spirit for Sydney. Perhaps related to Clover Moore’s big sparkler being set off. Still, it was an unusual sight and not one that is seen very often. Nice fly-pasts from the helicopter crews although the defence machines are noisy!